Like many other dedicated golfers, I’ve been working like hell to get my wife out on the course with me. We’re finally at the point where our daughter is in school and we actually have a little bit of time each day that we can get out and do something active together. When that free time for us started to open up, my immediate thought was that we should spend some of that time at our local club enjoying the walk together. My wife (Whitney) has grown up around golf but has never spent a lot of time out on the course. In our quest to get out and walk the course together, the first stumbling block we ran into was that there is a horrible shortage of decent golf gear for women that want to look good on the course. It’s pretty amazing really – all of these golf apparel companies and so little of it is something that is both functional and looks good. Short of re-purposing athletic workout gear, the only option that Whitney was able to find that she would gladly wear around the course was from golf, tennis, and active-sports designer Lija. Although I had never heard of Lija before, I knew that the company would stand out leaps and bounds ahead of any other golf company that I had seen when it came to a style that Whitney would like. Lija was kind enough to send over some samples for us to put to the test and I was finally able to convince Whitney to get out to the course. When we received the samples we only had another month or so of consistently warm weather – so we only had a few weeks to get the gear out and tested. When Whitney first saw the gear from Lija she was delighted with both the styling and the fit of the samples we received for review. I have to say this was a huge relief for me when I realized that I would finally be able to get her out on the course and in some golf clothing that she felt good about. 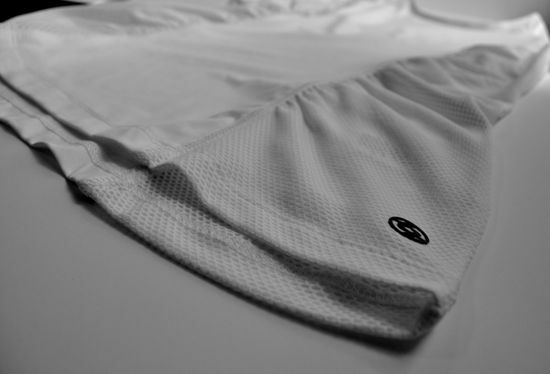 Lija sent us the Sprint Relay Skort and the Compression Gathered Tee. 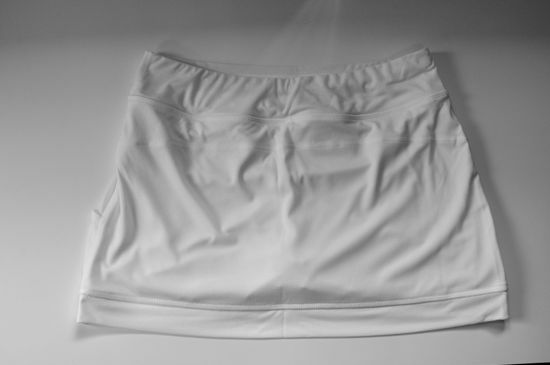 The Sprint Relay Skort is a short (13″) skirt with clean lines and two gathered pockets in the front. The material is 100% polyester with a stretch fit. The Compression Gathered Tee is very similar in look and feel to the skirt. The material is a polyester and spandex blend that combines a snug fit and breathable sides. Both of the pieces that Whitney reviewed came to us in white, so they were very easy to mix-and-match with other apparel that Whitney had. Easily mixing and matching gave Whitney many choices with just a few pieces when she combined it with other golf-appropriate fitness apparel that she used as everyday workout and casual wear. Lija has done a great job providing high-performance active gear. The shirt and skort that were tested both held up incredibly well everywhere from the golf course to the gym. The pieces are both extremely breathable and moisture wicking which are both prerequisites for the warmer months here in hot and humid North Carolina. All of the gear that was tested gets a solid score in the fashion and style department as well. As someone who watched Whitney go through rack-after-rack and site-after-site looking for some decent looking golf clothing, this is apparently extremely rare for the golf industry. The first was simply the color. With the white color combined with the thinness of the fabric, the shirt needed an additional shirt to be worn under the Compression Tee. Stacking the colors did work well and a compression shirt worn under the Compression Tee did allow for a way to provide nice accents to the shirt. The second issue Whitney had was with the Relay Skort constantly riding up while carrying her golf bag. While this wouldn’t be an issue in the cart, it is certainly a consideration for the walking golfers out there. 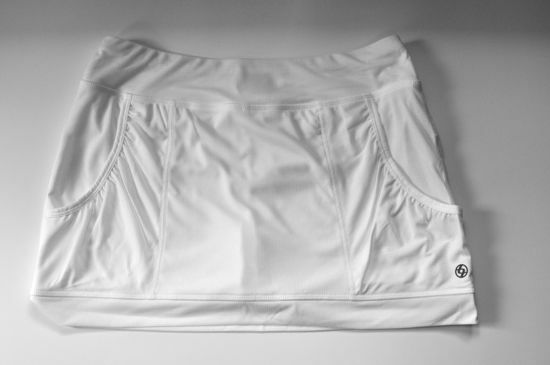 In all fairness – the Relay Skort is classified as a tennis item and not a golf item. All of the Lija golf skirts are a few inches longer and would likely not have the problem be so common. Lija is doing a great job by combining both function and fashion to make the game of golf more approachable for the younger women out there. I look forward to seeing the new golf line from Lija and still hold out a bit of hope that the other golf apparel companies out there will follow their lead and start making more apparel that the women golfers out there are proud to be wearing.